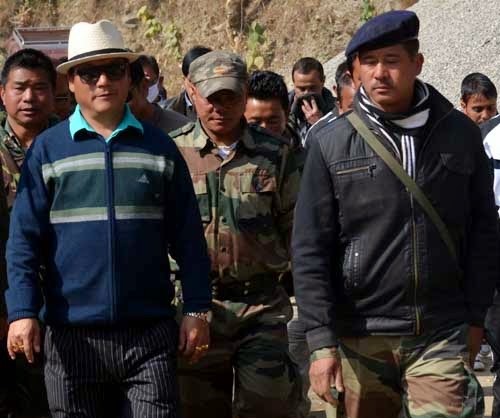 The Gorkha Janmukti Morcha on Thursday submitted a memorandum to the Darjeeling police superintendent seeking a review and a step-up of the security for Bimal Gurung, the Gorkhaland Territorial Administration chief executive, whose rank is at par with a state cabinet minister. This comes after Wednesday’s confrontation between the Morcha and the Gorkha National Liberation Front near Ghoom railway station. By virtue of his position as the GTA chief executive, Gurung is entitled to have a security cover comprising an assistant sub-inspector and six constables 24x7. The memorandum, signed by GJM general secretary Roshan Giri, asserts that the convoy of the GTA chief executive was attacked by GNLF supporters in Ghoom. “The convoy was waylaid near Ghoom station by GNLF supporters who were drunk. They abused the GTA chief executive and even tried to assault him,” claims the memorandum. Giri said the GJM condemns the Ghoom incident as it was a grave one having implications for the security of the GTA chief executive. “The district administration and the police were both aware of Mr Gurung’s itinerary for the day. The district police are responsible for ensuring proper security arrangements to enable the GTA chief executive to move freely, especially when a rival political party is holding a rally or function,” he said. Wednesday’s confrontation took place when GNLF supporters were on their way back from Darjeeling after attending the death rituals of Subash Ghisingh. And the GTA chief executive happened to be returning back to Darjeeling from Maneybhanjyang after laying the foundation stone for a road project. The GNLF had called a strike in Pokhraybong on Thursday demanding the arrest of the GJM cadres responsible for the assault. It was called off after three GJM supporters allegedly involved in the incident were arrested. They have been identified as Tukvar residents Nikit Rai, Abit Rai and Dharmadhoj Tamang. They were produced before the chief judicial magistrate court and granted bail. He added the situation in Pokhraybong is peaceful and more forces have been deployed to avert any untoward incident.